Hello everyone and welcome. Rebecca here with this fortnight's Friday Focus on metal charms and embellishments. There are so many new and wonderful metals for sale at The Funkie Junkie Boutique and the good news is that they are 15% off for the next two weeks! I'm running late with this project. I thought summer was supposed to be laid back, relaxing and restful, but life right now is calling me to run in a few directions at once, so I'm going to share a nearly finished project and some tips I learned along the way. I've had a small wooden box, with dovetailed joins that I have kept for a few years, sure that a project would pop up for it one of these days and last week I started to convert the bare wood, footless, unfinished interior into a trinket box. It contained chocolates and were a gift from Bernard, along with some red roses, waiting for me in our cabin when we took the Queen Mary 2 across the pond (the Atlantic pond that is). Not being drawn to cruising, I wasn't sure how it was going to be aboard a small floating town for more than a week. Before they slipped the moorings in New York harbor, I was in love with this ship and the idea of the crossing!! The next step was to paint every edge that might be exposed along with the inside walls of the box and the surfaces that touch each other when the box is closed. The exterior sides and top were going to be covered with paper, while the deepest recess on the inside of the bottom and top were going to be covered and didn't require paint. At first, I painted the edges white, but had a change of heart and used a very soft, pale buttermilk color. The last step I completed was to adhere these half round pearls to the painted edges of the lid. My plan is to add embellishments to the corners, the top of the latch and some more dimensional embellishments on the lid. I'm eyeing the new metal butterflies that are at The Funkie Junkie! I will try and remember to post it when it’s all done. Thanks for visiting and I my thoughts are with those of you dealing with the flooding and storming in so many parts of the country. These products used on the above project are available at The Funkie Junkie Boutique, where most name brand products are always 20% below MSRP. We're back for the second week of the latest challenge here at Frilly and Funkie. Can you believe we are half way through this year already? Where does time go? Thoughts of Christmas may be far away, but for this challenge cast your minds back to the 12 Tags of Christmas 2013 challenge set over at my blog, The Funkie Junkie. 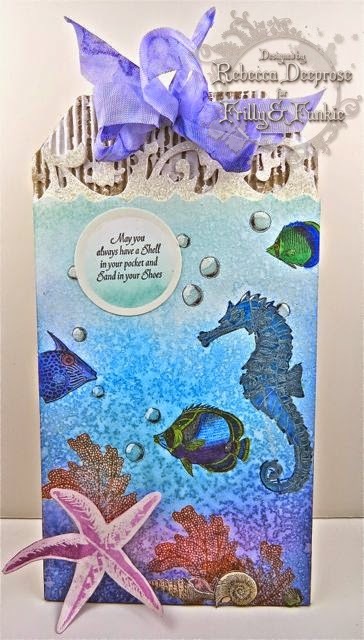 You need to base your card, tag, ATC, journal page or other project on one of those Christmas 2013 tags but with a summer twist. You must include a link to the tag you've CASEd and make sure you say which elements you've used as your inspiration. 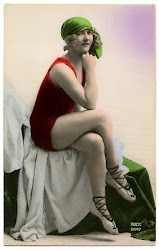 Remember, to enter you must create a new vintage style project with a summer theme, link it below and make sure you add a link in your post back to this challenge. You can combine our challenge with up to 10 challenges (including this one) to qualify. Alongside the Funkie team's projects we are thrilled to showcase a tag from our latest special Guest Designer, Anita Houston. A former member of the team, Anita has gone on to work with other high profile design teams, teaches her mixed media classes in the US where she is based, and as a CHA Designer Member has even had her worked displayed at the main trade conventions. 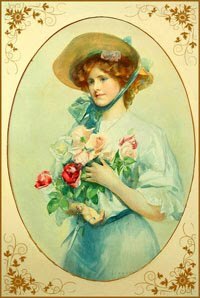 Please make sure you drop by her blog, The Artful Maven Haven, and take a much needed look around. Welcome to the beginning of another challenge here at Frilly and Funkie. Linda here as your host, and I'd like to start by thanking all of those who joined our previous challenge 'For All Our Fathers'. We've had some lovely entries and it's going to be another tough call for the Design Team. Can you believe we are half way through this year already? Where does time go? Thoughts of Christmas may be far away, but for this challenge cast your minds back to the 12 Tags of Christmas 2013 challenge set over at my blog, The Funkie Junkie. You could be chosen as our winner and be the next Guest Designer here at Frilly and Funkie. There is also the chance to win a $25 shopping spree at The Funkie Junkie Boutique for one lucky entrant chosen at random. So what are you waiting for? 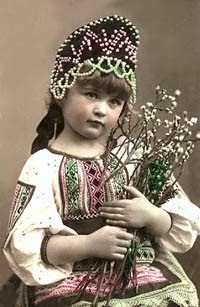 Welcome to the Frilly and Funkie challenge blog and yet another new week. That means we can announce the winners of the 'For All Our Fathers' challenge. We would like to thank you all of those who took the time to enter. There were so many fantastic vintage entries for this one and the Design Team ran really close when deliberating. 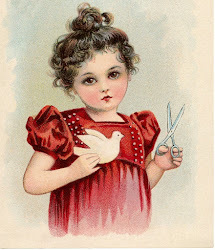 In the end the decision went with this super entry by #12 Katy - Postcards from the Attic. 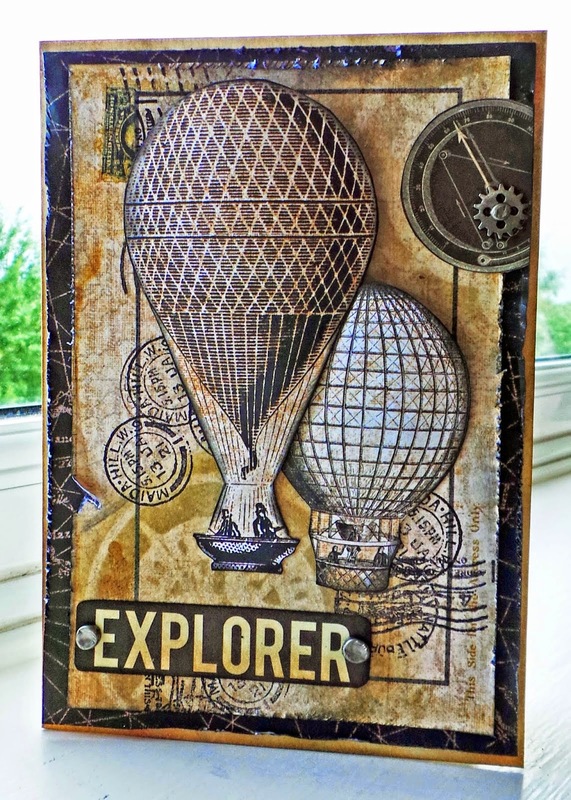 We loved the clever use of this Prima paper with its added masking and stamping. Congratulations Katy on being our favourite for the 'For All Our Fathers' challenge and winning the opportunity to be a Guest Designer here at Frilly and Funkie for a future challenge. 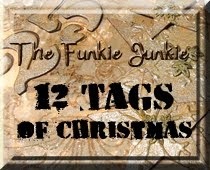 And Random.org has chosen a winner for our $25 gift certificate to The Funkie Junkie Boutique. Our congratulations go to #3 Jane's Journal. A huge thanks from the Frilly and Funkie team to everyone who took part in this challenge and congratulations again to our winners. Please email Linda at thefunkiejunkie@gmail.com for the codes for the winner's badge and to give us your email address for the Guest Designer details (Katy) and for the gift certificate details (Jane). Our current challenge, 'Just CASE It! ', runs through Tuesday, July 1st. We hope to see you entering this time around so that you too can be in with a chance to win. And remember, you can enter up to 10 challenges including ours, and a maximum of 3 entries per person to our challenge. Please remember to link back to our challenge in your entry and mention in your post that you are entering this Frilly and Funkie challenge. Hello, it's Sue here today and for a change I'm sharing a card that I've made. I don't make many cards these days so it was great to use some mixed media techniques on something different. I started by swiping some Distress Stains onto my craft sheet, spritzing them with water and pressing some white card on to the ink. I dried the card and then dabbed again on to the left over ink. I then placed a stencil over the card and using a baby wipe rubbed over the top. As Distress Stains, like the inks, react with liquids the baby wipe has a bleaching effect on the ink. The eagle eyed among you will also have spotted some Spritz and Flick ! I then started to build up the layers of stencilling. The new Archival colours by Wendy Vecchi are gorgeous and coupled with the new mini ink blending tool using the inks is really easy and effective ! I've used Orange Blossom on the above layer. Then I used Geranium Red, not using the whole of the stencil but adding bits here and there. I then decided I need to add some texture, so I mixed some Wendy Vecchi Crackle Paste with some Carnation Red and Tree Branch re-inker. It created an almost coral like colour, which I really loved ! I used the Prime Checker stencil and again only used parts of it around the corners. For the centre piece I've used one of Wendy's SiSi sets. I stamped the first image then masked it off and stamped it again. 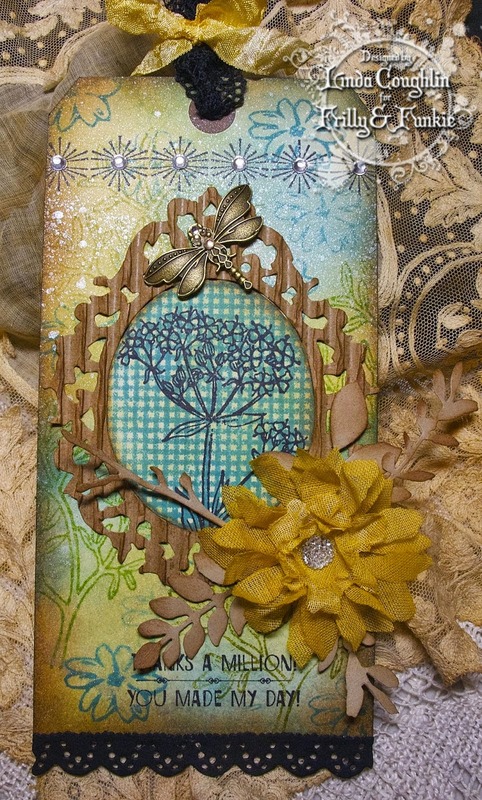 Then I used the stencil part of the set and placed it over the flower and stamped some script over the top. For the central bloom, I've painted the flower with Luminarte Silk paints and cut it out. Before mounting it on to foam pads I stamped it again onto the card and used a black oil pastel and drew around the flower head and used my finger to smudge it to create the shadow. I did some extra stamping with the little script stamp over the background. I then stamped the sentiment from the Wendy Vecchi True Art set onto some white card. Cut it up into different parts and rubbed some ink around the edge of each piece. One final photo in which I think you can just about see the crackle of the Crackle Paste ! Hope you've enjoyed today's Step x Step ! Welcome to today's Guest Designer, Claire ! Today we are welcoming back Claire of Claire's Crafty Creations as the Design Team's chosen winner of the 'Vintage Seaside Challenge'. I'm so happy to be Guest Designer at Frilly and Funkie as its one of my favourite challenges and I adore Linda's shop too. 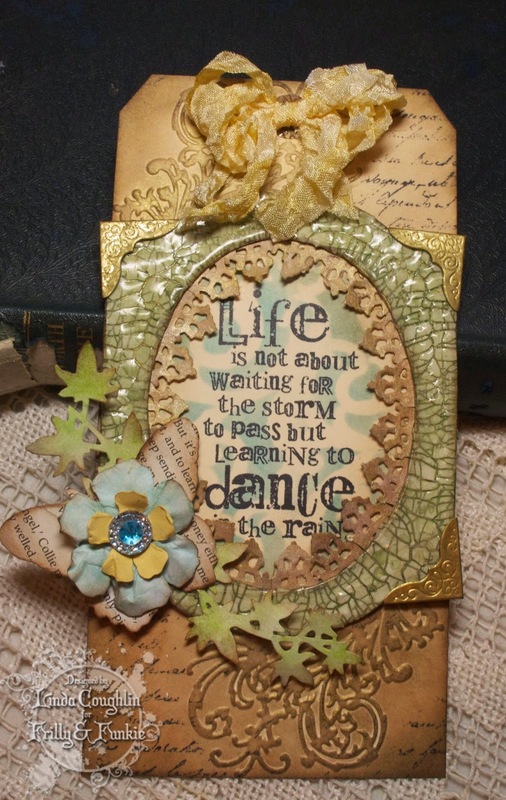 I love all kinds of crafting and enjoy playing around with paints, inks and stamps whenever I get the chance. I work full time for a charity and when I'm not at work you can usually find me walking my dogs or playing in my craft room. I was super excited when I found out the challenge theme as I always find Linda's tag challenge a real inspiration. I took my inspiration from the layout Linda used for her 12 Tags of Christmas design in Week 4, adding texture to the borders and using the burlap squares for some added texture, hope you like it. I'm sure you'll agree Claire's project is beautiful! If you want the chance to join us as a Guest Designer all you need to do is join in with the current challenge, 'Just Case It'. 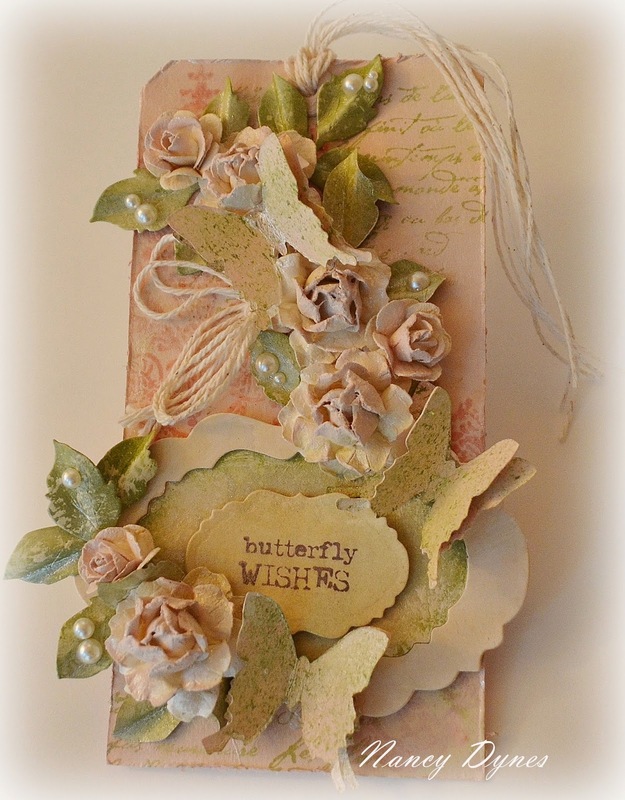 Welcome to today's Guest Designer, Susi ! Today we are welcoming Susi of Froebelsternchen as our Guest Designer. Susi was chosen by the DT as the winner of the 'Words, words, words' challenge. Let's move on to hear from Susi and see her beautiful project. I don't think I have a particular style, I am quite eclectic and I love using different layers and textures. I enjoy living in the countryside after leaving Vienna three years ago. Where I live, here in the North of Austria, nature is really pure, this is the main character of the "Waldviertel" - so a botanical theme tends to show up in my work quite a lot. I love birds - especially owls, trees, flowers and all animals. I don't really plan my projects beforehand, I just tend to go with how I am feeling or thinking at the time. I decided to make a Mixed Media Canvas out of an empty cereal box for the 'For All Our Fathers' theme. Since I have a very young "Papa" (as I call my Dad) he turned 70 this spring and I am crazy 50 right now, I always see him more as an older brother or friend, so I decided to create a very funky project for him. I started by collaging the cereal box with old book pages , DIY painted papers, parts of doilies and plaster bandages - painted over all with white Gesso and acrylics. The Dad from 1962 is a black & white out-print on my laser-printer (if you use an out-print of an inject printer you may seal before coloring with a coat of matte medium or Modge Podge, otherwise the image will smear). I over-painted the image with a coat of yellow acrylic and also some blue and green washes of acrylic paint and white gesso and a hint of red for his cheeks. It was then cut out and glued to my canvas. Outlined with a thin permanent black pigment - liner. After stamping some accents with acrylics I glued different sentiments and motifs from Stamper's Anonymous stamped on white tissue on the canvas. Sealed with two coats of fixative my canvas is ready for Papa! I'm sure you'll all agree that Susi's project is fabulous! If you would like to join us as a Guest Designer then all you need to do to be in with a chance is join in with the current challenge 'For all our Fathers'.